Recently, I had written an article on whether classic twentieth century musicals have run their course with such titles as Fiddler on the Roof, My Fair Lady and The King and I coming to mind. The latter is one that has always puzzled me for its continued fascination with audiences. The story chronicles the experiences of widow Mrs. Anna Leonowens, a British school teacher, who was hired as part of the King of Siam’s drive to modernize his country in the early 1860s. Mrs. Anna and her son Louis travel to Siam where she will teach the Royal Family all about British culture, etiquette, and customs. Since the King is also considered a barbarian, Mrs. Anna must also prepare a party for a group of English diplomats with the hope they will change their opinions about the King. The humour and the plot are also driven forward by Anna and the King as they are constantly at odds over how they see the society, the world and the relationships with all involved. I find The King and I’s story references to British colonialism rather dated for a twenty-first century audience. Such tuneful ditties as ‘Getting to Know You’ and ‘I Whistle a Happy Tune’ make it appear as if life will be immediately wonderful to live in foreign countries. I’m sure it is wonderful, but it takes time to get accustomed to life away ‘far from the home I love’, a reference from a heartfelt goodbye moment in Fiddler. Photo of Elena Shaddow and Jose Llana in the US tour of Rodgers & Hammerstein’s The King and I by Jeremy Daniel. There is a line from WICKED, now on stage at Toronto’s Ed Mirvish Theatre, where the Wizard tells Elphaba, “You have to give the people what they want.” I’m always thankful and appreciative the Mirvish company knows and respects their subscriber and audience base as they give theatre goers what they want. The Mirvishes do their best to ensure Toronto audiences have every opportunity to see a good show, and this King and I provided a golden opportunity. And yes, The King and I still entertained me even though I doubted. This touring US production contains top notch design values. Costumes are gorgeously resplendent in a multitude of colours. The open concept set, used to its fullest extent, is lushly framed with beautiful tapestries when the scenes are set in the palace. Every inch of this stage is used to effect from one scene to the next. I’m always amazed and impressed how professional companies can make chandeliers and planes appear. In this production, the boat at the top of the song carrying Louis Leonowens (Ryan Stout) and his mother Anna (Elena Shaddow) drew a few gasps from audience members around me. Pay close attention to Christopher Gattelli’s choreography (based on original by Jerome Robbins) in the second act with the ballet presentation of ‘The Small House of Uncle Thomas’ (Uncle Tom’s Cabin). This extraordinary ensemble of dancers created one of the visual highlights of the production for me. The musical number is intensely exciting to watch as each precisely timed and executed movement had a specific purpose to draw the presentation forward. Under Bartlett Sher’s solid direction, there are some lovely performances. As the servant Tuptim, Q Lim’s operatic vocal range longinly remained in the air after her achingly powerful duet in ‘We Kiss in a Shadow” with her intended Lun Tha (a strongly confident Kavin Panmeechao). Joan Almedilla as the King’s head wife, Lady Thiang, exudes a quiet but masterful composure of emotional self control. The introduction of the royal princes and princesses to Anna in ‘The March of Siamese children’ focused my attention on the hard-working young members of this touring company. The success of this US touring production for me lies in the tremendous performances of Elena Shaddow (Anna Leonowens) and Jose Llana (King of Siam). What a joy to watch both find those humourous moments in miscommunication and misunderstanding of cultural differences. Mr. Llana is a sometimes petulant, petty and childish King. He makes wonderful use of his eyes and face to reveal his puzzlement in understanding the ways of western culture. Ms. Shaddow conversely offers a dynamic and forcefully direct Anna who stands her ground and will not be pushed around by anyone, including His Majesty. Their passionate relationship heightens as their chemistry begins to gel. It’s amusing to watch Anna teach the King how to polka; however, the look of smoldering, fiery passion on Mr. Llana’s face when he securely reaches and places his right hand on Ms. Shaddow’s waist in ‘Shall We Dance’ is hot. 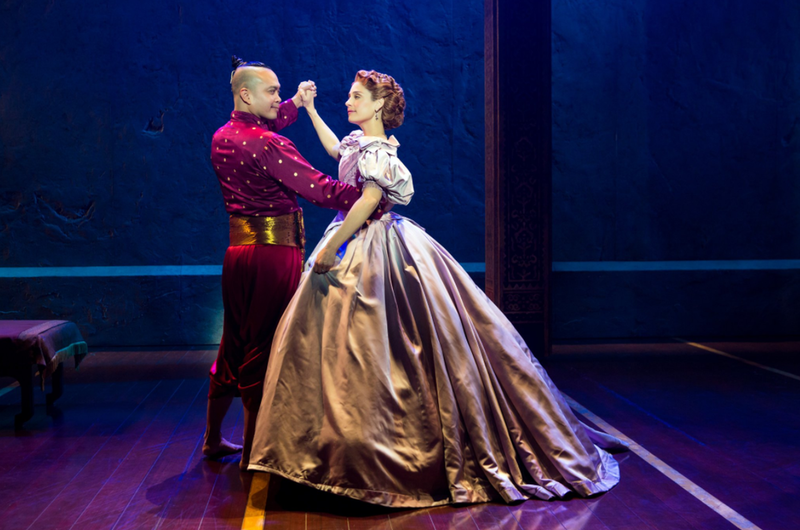 The King and I continues performances at The Princess of Wales Theatre, 300 King Street West, Toronto to August 12. Tickets may be purchased online at www.mirvish.com You may also telephone 1-416-872-1212 for tickets. Production directed by Bartlett Sher. Running Time of 2 hours and 50 minutes, including one intermission.